7.09(j) ["he fails to avoid a fielder who is attempting to field a batted ball or intentionally interferes with a thrown ball"] to the slightly more complex case of after-play interference, baseball has simply become more of a contact sport. » Catcher's (defensive) or 7.09(a) third strike ("clearly hinders the catcher"). 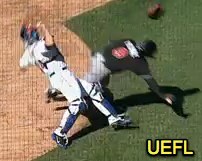 » Umpire's interference, hinders a catcher's throw attempting to prevent a stolen base or retire a runner. » (k) Fair ball touches batter or runner on fair territory before passing a non-pitcher or touching any fielder. » Umpire's interference, a fair ball touching an umpire on fair territory before passing any fielder. *7.09(d) [offensive huddle around a base to confuse the defense] may occur at any time. *7.09(h) [1B or 3B coach touches or holds the runner to physically assist him] may occur at any time. *7.09(i) [With R3, base coach leaves his box and acts in any manner to draw a throw] may occur at any time. On the other hand, not all contact is illegal. Nationals batter Denard Span safely arrived at first base and Danny Espinosa scored after baserunner R1 Roger Bernadina collided with Marlins second baseman Donovan Solano. Replays indicate that contact did not occur until after Solano already had fielded and was in possession of the batted ball. Bernadina was indeed tagged for the inning's second out; the contact between Bernadina and Solano therefore was related to the tag and not subject to Rule 7.09 interference. Had contact occurred prior to Solano's ability to field the batted ball, Bernadina would be declared out; if the umpires determined a secondary motive, Rule 7.09(f) authorizes a double play call, "If, in the judgment of the umpire, a base runner willfully and deliberately interferes with a batted ball or a fielder in the act of fielding a batted ball with the obvious intent to break up a double play." ^During the weekend's Marlins-Mets series, Marlins batter Greg Dobbs hit a single to right field, runner Juan Pierre scoring. Because the throw was offline, Mets catcher John Buck received the ball at the third base line extended edge of the dirt circle; as Buck attempted to throw to second base to make a play on Dobbs, the already-scored Pierre ran into the catcher, HP Umpire Jim Joyce ruling Dobbs out for Pierre's actions pursuant to Rule 7.09(e), which requires an interference call when, "Any batter or runner who has just been put out, or any runner who has just scored, hinders or impedes any following play being made on a runner. Such runner shall be declared out for the interference of his teammate." Not sure where to post this -- but did anyone else see how awful Marty Foster was tonight in the ninth inning? http://cdn2.mocksession.com/wp-content/uploads/2013/04/THIS-IS-NOT-A-STRIKE.gif -- Downright embarrassing, folks. Downright embarrassing. Foster to Maddon: "Pierzynski caught the ball poorly" ... According to Fox Sports, Foster opined "Had I had a chance to call that pitch again, I would not have called it a strike." that was one of those 'what the hell was i thinking?!?' calls- i think even marty was confused. and he had good mechanics, as in he paused and didn't call it too quickly. he must have just had 'strike' in his head and went with it. in any case, that's beyond terrible, especially on a game-ending call. really embarrassing and unfair for tampa. The Joyce call on Pierre was a gimme. I couldn't believe the manager even left his seat. Pierre's later comment was priceless stupidity - "They basically got rewarded for a bad throw." - No Juan, you got punished for being a terrible baserunner. The Fairchild call on the Espinosa play was brilliant.Taking the time to determine exactly when and where and how contact was made is why this play was called correctly. I understand why the manager came out; it was all likely to fast for him. I'm just glad he didn't talk himself into an ejection.